China bowl from Belleek features a large footed shell that is supported by sculptured sea coral. This limited edition archive Belleek bowl is limited to 700 pieces. This footed Belleek bowl is named Cardium on Shell and it features a large sea shell that is supported by coral. The fine china Belleek bowl is enhanced with pink accenting and stands 5" tall. The Irish bowl is handmade and hand painted in Belleek, Ireland. 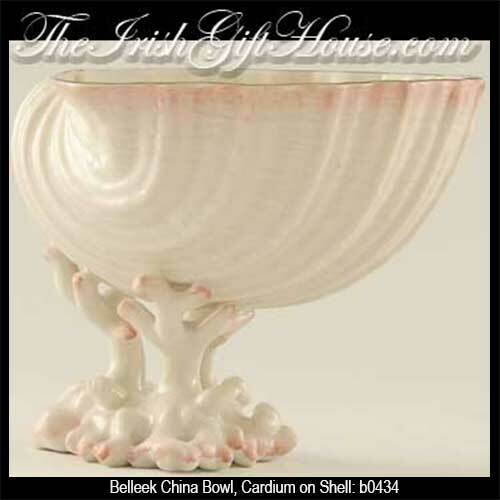 The Belleek Cardium on Shell Bowl is gift boxed in its original packaging, complements of The Irish Gift House.